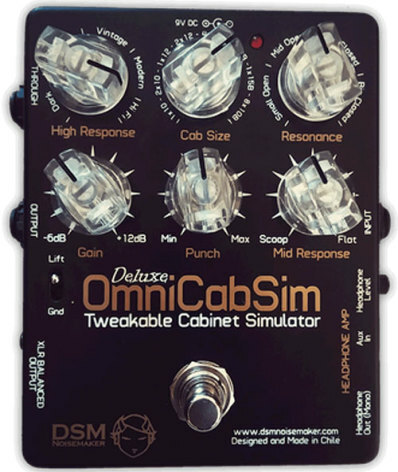 A cabinet simulator is a device designed to emulate the frequency response of a speaker system. Guitar and bass speaker systems have a very pronounced filtering effect, rolling off the low and high frequencies very sharply due to their physical and electrical properties. Things like cone size, material, impedance, enclosure size and type, even distance from a wall, affect these filters very noticeably. The Philosophy behind the design is to allow the user to CREATE their own cabinet response settings, moving away from the typical preset cabinet simulators in the market. 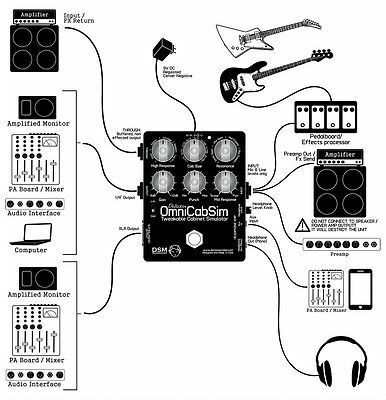 This approach let the musician to define his own sound and getting an accurate reproduction of it when recording and playing live gigs, without depending on mic placement, amplifier or cabinet availability..Just dial in your favorite tone, tune your cabinet response and go straight to the PA or recording gear!! Mic and Line output. Compensate levels with the gain control. Tunable high frequency response emulates the steep low pass filter that different speakers produce. Tunable Low frequency response that controls the low end roll off typical of speaker of various sizes. Tunable low frequency resonance lets you dial the resonance of the low end roll off point, reproducing the effect of closed or open back cabinets, and anything in between. Mid control lets you dial “modern” or “vintage” responses. Punch control boosts the 800 Hz band, that lets you cut through the mix with warmth.